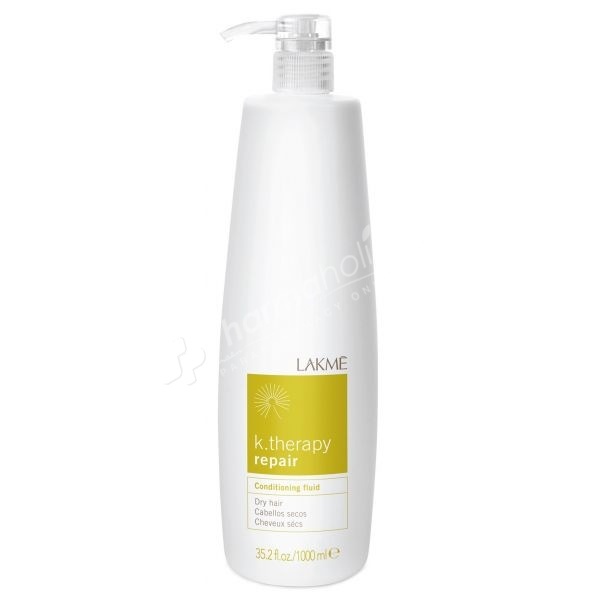 Lakme K.therapy Repair Conditioning Fluid The lack of lipids (sebum) and excessive loss of moisture from the scalp may damage the hair fibre until it becomes dehydrated. This nourishing conditioner specifically for dry and very dry hair rebalances, nourishes and moisturizes. Nourishing conditioner for dry hair. Conditions and softens dry and very dry hair. Acqua-Oil Complex: Reconstitutes the protective hydrolyptic layer. The scalp becomes comfortable. Babassu oil(from the Brazilian Amazon): Nourishing and softening properties. Avoids dehydration, protects the hair and provides shine. Hydromanil™: Hydrating sugar complex which is freed in sequence to capture the moisture in the skin. Immediate and long-lasting hydrating effect. Water from the Zermatt glacier: Water containing minerals and oligoelements with decongestant and natural properties which soften and protect the skin. Invigorating fragrance: Full bodied fragrance with aquatic aromas on a woody base. Spread over washed and towel-dried hair. Apply to middle section of hair and ends.